Shemot/Exodus 10:28 Watch yourself that you do not see my face again, for on the day you see my face, you will die. HaShem to allow him to enter the Land: "But because of you the LORD was angry with me and would not listen to me. 'That is enough,' the L-RD said. ' Do not speak to me anymore about this matter'" (D'varim 3:26, NIV). In both cases, it appears that Pharaoh and HaShem intend to close the subject permanently at that point; no further discussion is allowed! Ibn Ezra attempts to play this down by suggesting that Pharaoh really meant, "I will have you killed for violating the royal edict" (quoted by Michael Carasik. On the other hand, it is supported by HaShem's response to Moshe at Mt. Sinai when he asks to be shown HaShem's glory: "You cannot see My face, for no man can see Me and live!" (Shemot 33:20, NASB). Seeing HaShem, face-to-face as it were, would cause death. 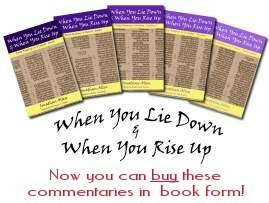 The Scripture list a number of occasions when people expect to die after seeing HaShem, for example: Isaiah's vision in the Temple - "Woe is me; I am lost! For I am a man of unclean lips and I live among a people of unclean lips; yet my own eyes have beheld The King L-RD of Hosts" (Isaiah 6:5, JPS); Gideon's visitation by the Angel of the L-rd - "Gideon said, 'Alas, O L-rd G-D! For I have seen an angel of the L-RD face to face.' But the L-RD said to him, 'All is well; have no fear1, you shall not die'" (Judges 6:22-23, JPS). The New Covenant Scriptures also seem to support this idea. John opens his gospel with the observation that "No-one has ever seen G-d" (John 1:18) and Rav Sha'ul tells Timothy that G-d "dwells in unapproachable light that no human being has ever seen or can see" (1 Timothy 6:16, CJB). Just as Daniel saw G-d - "As I looked, thrones were placed, and the Ancient of Days took His seat; His clothing was white as snow, and the hair of His head like pure wool; His throne was fiery flames; its wheels were burning fire" (Daniel 7:9, ESV) - and the pre-incarnate Yeshua - "I saw in the night visions, and behold, with the clouds of heaven there came One like a Son of Man, and He came to the Ancient of Days and was presented before Him. And to Him was given dominion and glory and a kingdom, that all peoples, nations, and languages should serve Him; His dominion is an everlasting dominion, which shall not pass away, and His kingdom one that shall not be destroyed" (vv. 13-14, ESV) - and was disturbed: "my spirit within me was anxious, and the visions of my head alarmed me" (v. 15, ESV), so John too had a stunningly similar vision of Yeshua, "wearing a robe down to His feet and a gold band around His chest. His head and hair were as white as snow-white wool, His eyes like a fiery flame, His feet like burnished brass refined in a furnace, and His voice like the sound of rushing waters. In His right hand He held seven stars, out of His mouth went a sharp double-edged sword, and His face was like the sun shining in full strength" (Revelation 1:13-16, CJB). The effects were the same: "When I saw Him, I fell down at His feet like a dead man. He placed His right hand upon me and said, "Don't be afraid! I am the First and the Last, the Living One" (vv. 17-18a, CJB). John too feared the worst and had to be assured in the usual way - don't be afraid. The picture, on the other hand, is not all one-sided. G-d, it would appear, has made Himself directly available to us in Yeshua. The passage that we have quoted many times - "Long ago, at many times and in many ways, G-d spoke to our fathers by the prophets, but in these last days He has spoken to us by His Son, whom He appointed the heir of all things, through whom also He created the world. He is the radiance of the glory of G-d and the exact imprint of His nature, and He upholds the universe by the word of His power" (Hebrew 1:1-3, ESV) - picks up on the vision of Daniel (above) and explains that Yeshua is the "exact likeness" (v. 3, GWT) of G-d, a perfect "reflection of G-d's glory" GWT). John echoes that in his gospel, when he says, "The Word became human and lived among us. We saw His glory. It was the glory that the Father shares with His only Son, a glory full of kindness and truth" (John 1:14, GWT). What? The disciples actually saw Yeshua - He lived with them? John insists that this really is what he means: "We have heard Him, we have seen Him with our eyes, we have contemplated Him, we have touched Him with our hands! The life appeared, and we have seen it. We are testifying to it and announcing it to you - eternal life! He was with the Father, and He appeared to us. What we have seen and heard, we are proclaiming to you" (1 John 1:1-3, CJB). How does this work - how can it possibly work? Rav Sha'ul, in another passage that we have frequently quoted, "though He was in the form of G-d, [He] did not count equality with G-d a thing to be grasped, but made Himself nothing, taking the form of a servant, being born in the likeness of men" (Philippians 2:5-7, ESV). Other versions shed useful light upon that phrase "He made Himself nothing" (ESV, NIV) at the start of verse 7: "He emptied Himself" CJB, GWT, NASB, NRSV), "He have up His divine privileges" (NLT). The disciples were able to see, touch, hear Yeshua for themselves because He set aside - voluntarily and temporarily - part of His glory, the divine nature, in order to live with, teach, talk to and be understood by the disciples. Throughout the church age, there have been reports of Yeshua appearing in dreams and visions both to believers and non-believers. Fred Lemon, for example, reports how Yeshua and two "men" appeared to him one night in his prison cell in Dartmoor high security prison, dressed in suits2. There are many credible contemporary reports of Yeshua appearing to Muslim people, in Muslim countries where Bibles and other open witnesses to the gospel are not allowed. Peoples' lives are changed as they see the face of Yeshua and are transformed by His love and grace. This is why John is so insistent with his report: "What we have seen and heard, we are proclaiming to you; so that you too may have fellowship with us. Our fellowship is with the Father and with his Son, Yeshua the Messiah" (1 John 1:3, CJB). How do we have relationship with G-d? How do we approach a holy and righteous G-d without being struck dead? In Yeshua, the Messiah of Israel and Saviour of the world. There is no other way - Yeshua Himself said, "I am the Way, the Truth and the Life - no-one comes to the Father by through Me" (John 14:6). If you know Yeshua, then you have already passed from death to life (John 5:4), you are a new creation (2 Corinthians 5:17) and there is no condemnation hanging over you (Romans 8:1); in Him you can look G-d square in the eye. If you do not know Yeshua, then you cannot see G-d's face and live! 1. - Interestingly, another instance of . Application: Do you know Yeshua? If not, you need to get to know Him without delay. Cry out to G-d and ask Him to show you the truth about Yeshua and then do as He says: believe in Him that you "may not perish but have everlasting life" (John 3:16).